You are here: Home / @Home / Bug Off! Dengue cases are up and with a cloudy/ rainy weather that threatens to stay for a few more days, we need at least one good insect repellent not only at home, but even for traveling as well. Handy Tidy is a mixture of plant, herbs, fruits and vegetable extracts uniquely combined and formulated to exhibit powerful bactericidal, fungicidal and virucidal action; and as such, it could be used as disinfectant and odor eliminator in places where human activities are very common. It protects from some pathogenic microorganisms than can be easily transmitted when you travel. How does this spray fight against insects? According to Plantex, this product has limnoids which create hormonal disruption affecting the reproductive system of insects such as mosquitoes, and flies, thus preventing them from propagation and eventually cause their death. The result is an environment that is non-conducive to insect habitation. How to use: Directly spray to surface/ area where you need to disinfect and eliminate odor. Shake well before use. Kids and adults love this milky lotion insect repellent. We love Shoo Fly, too! The smell is so yummy and relaxing. It may be used as a lotion for babies, moms and those with sensitive skin. How to use: Shake then apply liberally on skin after bath. Reapply after 3-4 hours or after playtime. Ingredients: Made from aloe vera gel, witch hazel, grapeseed oil, distilled water, and lavender, rose, geranium, citronella and eucalyptus essential oils. 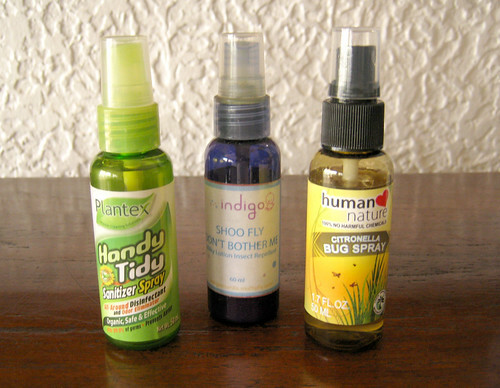 Shoo off mosquitoes and other pesky bugs with an effective, organic antidote. With natural skin moisturizers your skin will thank you for it! Citronella Bug Spray was formulated with children in mind that is why this pocket-sized insect repellent is free of parabens, phthalates, SLS/SLES, formaldehyde, and other toxic substances such as DEET. How to use: Spray directly onto arms, legs, and other exposed areas. Do not spray on the face. If it gets into eyes, quickly wash off with water. We just started using Handy Tidy the other day, so we can’t say much about it except for what Plantex inventor, Ms. Dinky Hementera, told us– that it is an effective all-in-one handy disinfectant, odor eliminator and insect repellent. We love the smell and effectiveness of Shoo Fly, while Citronella Bug Spray‘s ingredients are simply VCO and citronella. We like the fact that there are only two ingredients in the spray, both are organic and 100% sourced here in the Philippines. How about you? What is your game plan to bug off those pesky mosquitoes? Are any of these products regulated by the EPA or CDC? Thanks for your query, Tina. We are not sure if EPA/CDC regulation extend to Philippines but we forwarded your question to the producers. We hope to hear from them soon. Does handy tidy contain any oils? I’m looking for something to spray on my vermicompost (worm compost) bin to prevent insects from coming in. I am not sure if Handy Tidy contains oils. What kind of insects are you trying to get rid of? Flies? Hi, where can I buy these products? These sprays are available at ECHOstore and Sesou in Market Market. Has anyone made a review about Bioneem spray. I think it holds a lot of promises. I just want to know if it’s oily or greasy. I used to use pure citronella oil and the scent can be overbearing, and it makes the skin sticky. I use the bioneem Liquid concentrate, it also has liminoids. I use it to ‘fumigate’ the house. My fave is Shoo Fly Don’t Bother Me. It’s not sticky when applied to the skin and the scent is mild. I didn’t like the smell of Human Heart Nature, I find it too strong and sticky to the skin. One brand I use is the Giga Insect Repellant Spray, love the kids variant because of it’s scent but other variants like Eucalyptus is good too. It’s more affordable than Shoo Fly pa. There are many dealers of Human Nature. You may order from Juan Market at +0933 655 2722 or at juanmarket.ph@gmail.com. Look for Ana. You can also check out Human Heart Nature’s website and see if there’s a reseller near you!